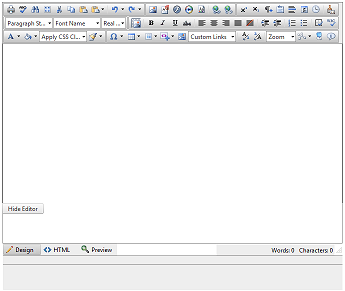 When an editor is set with an initially hidden wrapper, its layout may appear broken when it is shown dynamically. This article contains examples of the most common scenarios in which similar issues occur and offers ways to resolve them. When the editor is placed in an initially hidden container and the page rendering starts, the calculation logic breaks, because the control’s HTML elements do not have proper height. On showing the container dynamically, the height of the editor appears incorrect and in some cases the content area is not clickable or editable (commonly described as disabled). In this scenario, Telerik’s Editor is added to the page during a partial post back and its parent is notvisible initially, this is changed on the server. In this case, the layout is broken because the CSS styles of the editor are not yet loaded when the HTML is rendered, so the control does not have all its appearance rules available when it has to calculate its layout. This may cause an issue with the editor’s dimensions. This issue is fixed since 2014 Q1 version of the Telerik® UI for ASP.NET AJAX suite. The solution to this problem is achieved by implementing a logic that verifies that the needed resources are loaded and recalculates the editor’s dimensions. This behavior may cause a small flickering, due to possible delay of CSS resources. If this causes any inconvenience (e.g. the delay is about 3-5 sec.) with the user experience, you can try enabling the CDN support or using the workarounds from Examples 1-3. Figure 1: Example of the broken layout. The workaround for this problem is to register the RadEditor’s CSS files manually on the page. For this case follow Example 1. You should add the needed stylesheets for all child controls depending on the ToolbarMode. See Example 2. Example 1: Showing and hiding a RadEditor control dynamically via AJAX. 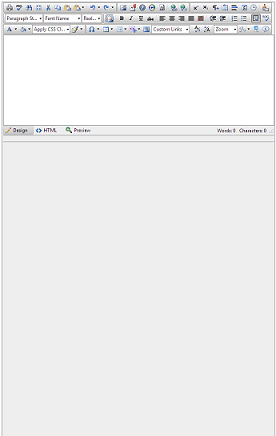 Example 2: Showing an initially hidden RadEditor with ToolbarMode=RibbonBar. It requires that the proper stylesheets get registered. This example includes a skin from the Telerik.Web.UI.Skins assembly as well. Example 3: If the other options do not help, you can try calling the repaint() method of the editor after its resources are loaded. The example below is a stub, you should tweak it once you see if this approach helps (e.g., add timeouts or intervals and counters). You can try calling it from the browser console manually first to determine if it helps. Figure 2: Broken layout of the RadEditor control, due to the initial visibility of the wrapper. To resolve this, call the repaint() method of the editor, after the container is shown.You can examine the exact scenario and the described solution in Example 4. Example 4: Showing and hiding the RadEditor control dynamically. <telerik:RadButton RenderMode="Lightweight" runat="server" ID="RadButton1" Text="Toggle Visibility"
Sometimes the editor is moved in the DOM to another place to offer editing capabilities there. Due to such actions its content area appears disabled.This is happening because the editor’s functionality highly dependent on its parent elements along with the initially attached events to the editable iframe element. A common related scenario is when a RadEditor is placed inside a RadWindow’s ContentTemplate to provide a popup editing. To resolve this, the editor’s onParentNodeChanged() method must be called each timethe editor is moved into another DOM element. Working example of such a scenario is available in Example 5. Example 5: Moving the RadEditor in different DOM elements. <telerik:RadButton RenderMode="Lightweight" runat="server" ID="RadButton1" Text="Move editor here"
<telerik:RadButton RenderMode="Lightweight" runat="server" ID="RadButton2" Text="Move editor here"
Due to fluid layout requirements of the applications, the editor’s Width property may be set to a percentage value.This lets the control resize along with the browser window resizing. If the width becomes insufficient the editor’s height will increase and may overlay other controls on the page. Figure 3: Example of an editor that is too narrow. The solution for this problem is to attach a handler to the resize event of the window object, which implements logic that invokes the repaint() method. Example 6 provides an example of such a scenario and the workaround. Example 6: Setting the Width property in percent.